Apple has today released a new iPhone 5s commercial that is guaranteed to pull the heart’s strings. The perfectly timed video ad follows the company’s annual trend of releasing a product commercial at this time of year, this time featuring the flagship iPhone 5s smartphone capturing high-definition video of the family Christmas festivities. The iPhone is then used in conjunction with an Apple TV and Apple’s AirPlay protocol to allow the ‘Harris‘ family to watch the video together on a big screen TV. The ‘Misunderstood’ commercial is clearly designed to invoke an emotional reaction from those watching it by depicting various scenes from the traditional family Christmas. The family in question is seen decorating the tree together, making snow angels in the garden and sledging through the thick snow before warming up around a fire. One of the younger members then gathers his family around the TV set before initiating the recorded family experience over AirPlay for everyone to watch. And to top things off, the well-known Christmas song "Have Yourself a Merry Little Christmas" is playing throughout the video. Apple is well known for creating and sharing commercials of this nature during the holiday season. Last year’s offering heavily promoted the iPad and the FaceTime video calling service, whereas the 2011 commercial featured a technologically advanced Santa Claus interacting with Apple’s Siri digital assistant on an iPhone 4s. Each festive ad is usually extremely well received, but this year’s could be the best yet. Apple’s recent success has been down to the fact that consumers feel an emotional attachment to their products and considering the entire Harris family experience was shot using an iPhone 5s, it looks like they’ve done it again this year. The beautiful thing about this latest release is that it actually abstracts away the technology elements. Various parts of the commercial give the impression that a smartphone is being used to shine light onto the face of a family member. However, they don’t actually show the iPhone 5s or the Apple TV unit. The ad simply concentrates on the emotion and strength of feeling that accompanies a family Christmas, and allows the viewer to naturally come to the conclusion that the product will enhance that experience. 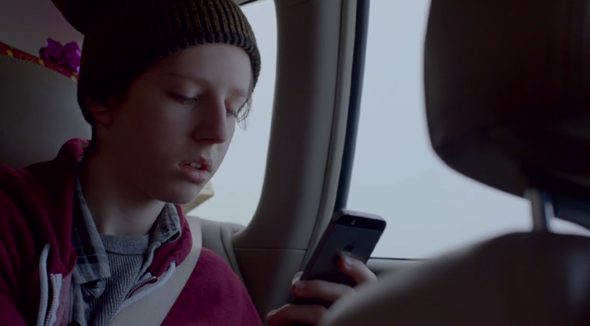 The commercial finishes with Apple wishing us all "Happy Holidays".